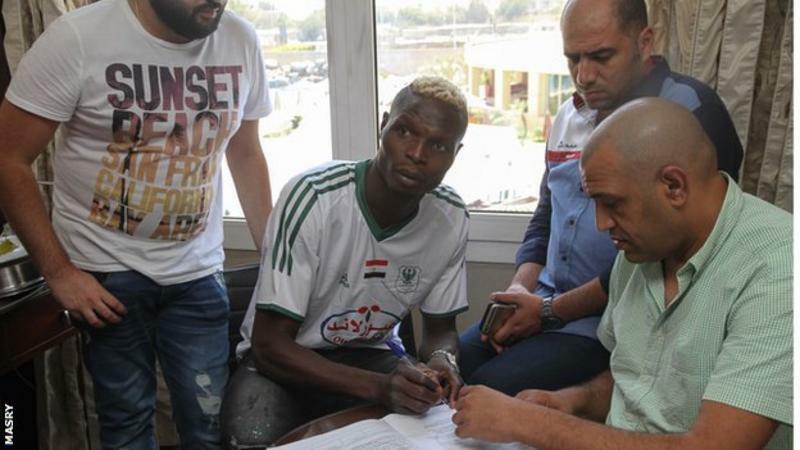 Burkina Faso striker Aristide Bance has completed his transfer from Ivory Coast's ASEC Mimosas to Egyptian side Al Masry on a two year deal. The club announced on their website that Bance put pen to paper after nine hours of negotiations in Cairo. 32-year-old Bance has become a cult hero for Burkinabe fans and has played his league football extensively across Europe and Africa. The charismatic forward told reporters he is excited about his new challenge. "I am happy to be here in Egypt and especially with Al Masry," Bance said after signing his contract. "I had many offers but picked up Al Masry because of their head coach Hossam Hassan who is one of African football's legends. "Since I was a young I used to watch him playing and it's an honour to play under his leadership today. Has this guy ever scored a goal? The guy is always hyped to like he is Messi and Ronaldo combined in every tournament but never scores. Always blasting balls 100 feet above the post like Okocha. I thought he was rumored to be going to a Nigerian club at one time. 21 goals in 67 appearances for his country is nothing to sniff at. why even bother mister bout it bout it. Most of it must have come against minnows like Ghana. He was not good enough. Even Messi would die to join RU. You miss the point badly! Aristice 'Arid' Bance is a non-scoring striker phenomenon. He cannot be judged on trifles like goals scored! Are you joking? I hardly watch Burkina Fasco but I know that with him on the field they stand a greater chance of putting the ball in the back of the net! ...he is the Messi and Ronaldo of Africa, and Ghana is in Africa, Egypt is in Africa hence the big news signing.